0-8-0 steam locomotive and tender. Three straight FasTrack track sections, one FasTrack terminal section, eight curved FasTrack track sections. Transformer controlled forward, neutral, and reverse operation. Electronic steam whistle with On/Off switch. Die-cast operating coupler on front of locomotive. Operating coupler on rear of tender. Die-cast metal locomotive body and frame. Silver metal rims on drive wheels. Trees and presents loaded on gondola. Die-cast sprung trucks on boxcar and gondola. Metal ladders and toolbox on caboose. Lubrication & Maintenance of R-T-R Locomotive. 47 / Layout: 40 x 60. The item "Lionel 6-30184 The Polar Express 0-8-0 Steam Freight ready to run set" is in sale since Wednesday, September 26, 2018. 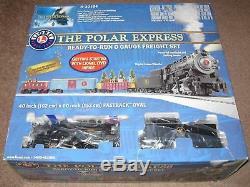 This item is in the category "Toys & Hobbies\Model Railroads & Trains\O Scale\Starter Sets & Packs". The seller is "partsandtrains" and is located in Plymouth, Michigan.